The aim of this work was to study the efficacy of hyoscine butylbromide (HBB) for shortening of the first stage of labor in primigravid women. Prolonged labor is one of the most important risk factors for perinatal compromise and, if caused by obstructed labor, it carries the risk for uterine rupture, postpartum hemorrhage, puerperal sepsis, and maternal death. The study was a randomized, double-blinded, controlled trial. One hundred and ten primigravid term pregnant women in spontaneous labor received either HBB or a placebo intramuscularly once the women entered the active phase of labor. The primary outcome measured was the duration of the first stage of labor. Secondary outcomes were the duration of the second and third stages of labor, blood loss at delivery, rate of cesarean section, and Apgar scores for the neonates. A total of 110 women yielded data for analysis. Of them, 55 women received HBB and 55 received placebo. The mean duration of the first stage in the study group was 208.16 ± 17.24 min, compared with 258.16 ± 15.27 min in the control group; there was a highly significant statistical difference (P = 0.00). There were no significant changes in the duration of the second stages of labor (P = 0.09). There were no significant changes in the duration of the third stages of labor (P = 0.16). There were no significant statistical differences in blood loss or Apgar scores. There was no significant statistical difference in the cesarean section rate or instrumental delivery. HBB is effective in significantly reducing the duration of the first stage of labor and is not associated with any apparent short-term adverse outcomes in the mother or neonate. Dystocia remains the most common indication for emergency cesarean section in England and for primary cesarean section in the USA. As such, it is a major contributor to operative and instrumental intervention, especially in nulliparous women ,. This is a major clinical problem in modern obstetric practice and intrapartum care, causing substantial suffering to the mother and her offspring . Factors influencing maternal and neonatal outcome of pregnancy have been considered by researchers. Duration of labor varies widely depending on demographic, clinical, and genetic factors, uterine activity, fetal lie or presentation, and number of fetuses . The safety of active management of labor has been demonstrated by several prospective randomized clinical trials involving over 3000 women. A shorter duration of labor from admission to delivery has also been consistently reported in numerous studies of women treated with the active management protocol . Hyoscine butylbromide (HBB) belongs to the parasympatholytic group of drugs and is a semisynthetic derivative of scopolamine. It is an effective antispasmodic drug without the untoward side effects of atropine. HBB acts primarily by blocking the transmission of neural impulses in the intraneural parasympathetic ganglia of abdominal organs, apparently inhibiting cholinergic transmission in the synapses of the abdominal and pelvic parasympathetic ganglia, thus relieving spasms in the smooth muscles of gastrointestinal, biliary, urinary tract, and female genital organs, especially the cervicouterine plexus, thus aiding cervical dilatation . Spasmolytic drugs are frequently used in delivery rooms to overcome cervical spasms and thus reduce the duration of labor . The anticholinergic spasmolytics have undesirable anticholinergic side effects. Hence, nonanticholinergic spasmolytics are preferred during pregnancy. Hyoscyamine when injected into humans during pregnancy has been reported to increase the fetal heartbeat. There have been several studies on different antispasmodic agents that shorten the first stage of labor . Medical interventions related to prolonged time of delivery had increased during the last years, although perinatal results over the same period, particularly those of cerebral palsy. Initially, active management of labor was associated with a low cesarean section rate, in association with earlier interventions ,. Because some pregnant women prefer and require little or no medical intervention during labor, homebirth rates are rising slightly and many home-like birth centers have been established near conventional labor wards. Meta-analysis shows some benefits from home-like settings for childbirth, such as lower rates of intervention. Moreover, they are associated with higher levels of patient satisfaction with care . The debate on the interventions associated with active management has focused on the cesarean section rates, but other considerations can be very important to individual women, who might, therefore, prefer acceleration for nonmedical reasons. It has been demonstrated that artificial rupture of membranes alone, when used systematically, leads to a significant and substantial diminution in the duration of labor . The study was conducted during the period from 2015 to 2016 at Menoufia University Hospitals (Egypt). The study protocol was approved by the local ethics committee of the Department of Obstetrics and Gynecology, Menoufia University. All participants provided written informed consent before inclusion into the study. The study involved 110 pregnant women. Inclusion criteria were as follows: primigravid women aged 20 years or older; singleton pregnancy presenting by the vertex; gestational age between 37 and 42 weeks; and established, spontaneous labor with either intact membranes or spontaneous rupture of membranes for less than 12 h (established labor is defined as the presence of regular two to three uterine contractions every 10 min, associated with progressive cervical effacement and dilatation). Examination was carried out by the same examiner. Exclusion criteria were as follows: previous uterine scarring, malpresentation, antepartum hemorrhage, multiparity, twin pregnancy, labor induction, prolonged premature rupture of membranes (>12 h), epidural analgesia, contraindication to vaginal delivery, and contraindication to hyoscine. Group 2 (the control group), which included 55 pregnant women who received prefilled 2 ml normal saline through IMI. On admission, enrolled women were assigned to one of the described interventions according to a trial sequence, which was prepared using random number table in a statistical text book, and then the determined assignment sequence was hidden in sequentially numbered, opaque, sealed envelopes. The trial was double-blinded; the caregivers and the participants were blinded to the type of intervention. A partogram was maintained throughout labor. Cardiotocography (CTG) was used to record fetal heart rate; augmentation with oxytocin was carried out if needed. At the end of the study, the data collected were tabulated and analyzed using statistical package for the social science software (SPSS, IBM, Chicago, USA). The results were expressed by applying ranges, means ± SD, the c2-test, t- test, and P values. The study showed that there was no significant difference between the two groups as regards maternal age, BMI, gestational age, maternal disease, hemoglobin concentration, and occupation [Table 1]. There was a highly significant statistical difference between the two groups as regards duration from admission until full cervical dilation, duration from admission until delivery, and rate of cervical dilation (P = 0.00). However, there was no significant statistical difference between the two groups as regards augmentation of labor, duration of second stage of labor, duration of third stage of labor, and mode of delivery. 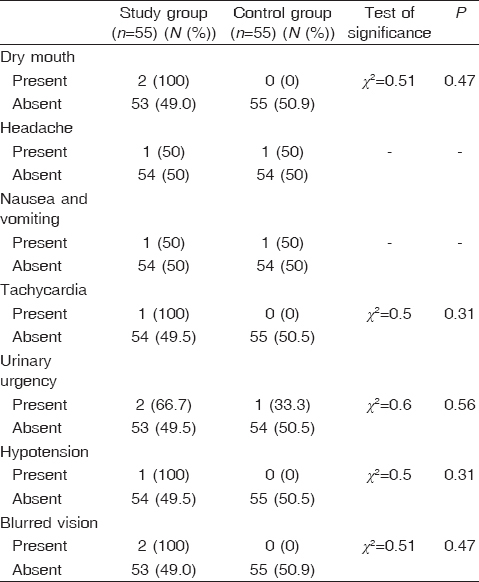 No patients suffered from postpartum hemorrhage in both groups [Table 2] and [Figure 1]. There was no significant statistical difference between the two groups as regards the adverse effect of HBB [Table 3] and [Figure 2]. There was no significant statistical difference between the two groups as regards CTG changes, Apgar score at 1 and 5 min, neonatal intensive care unit admission, and neonatal weight [Table 4] and [Figure 3]. 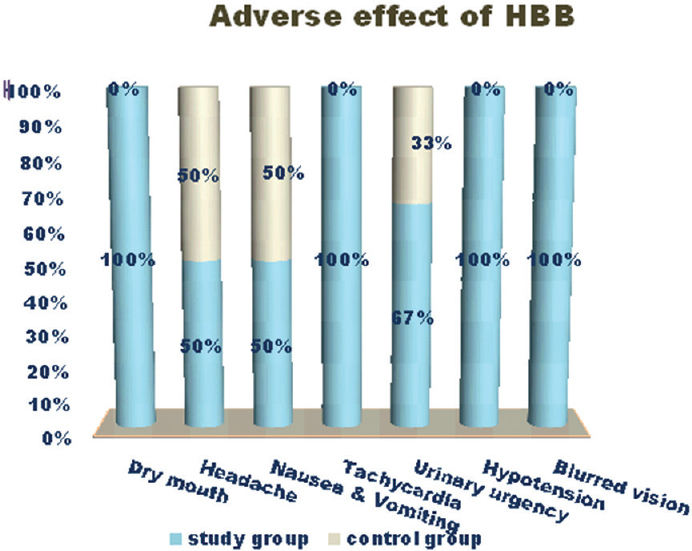 Figure 2: Adverse effects of hyoscine butylbromide (HBB). This randomized controlled study was conducted with an objective to evaluate the efficacy of HBB for shortening of the first stage of labor in primigravid women. The reduction in first-stage duration may also prove to be of particular importance for women with a borderline placental reserve, oligohydramnios, or risk for prolonged variable deceleration during labor, as may be encountered in women with hypertension (both chronic and gestational) and in women with hemolytic anemia, which is quite common in Egyptian population. Prolonged labor in these women may result in the fetoplacental reserves becoming depleted, with consequent signs of fetal distress and an increased cesarean section rate . In the present study, the mean duration from admission until full cervical dilatation was 208.16 ± 17.24 min in the study group compared with 258.16 ± 15.27 min in the control group. Thus, the duration from admission until full cervical dilatation was shortened by 50 min. 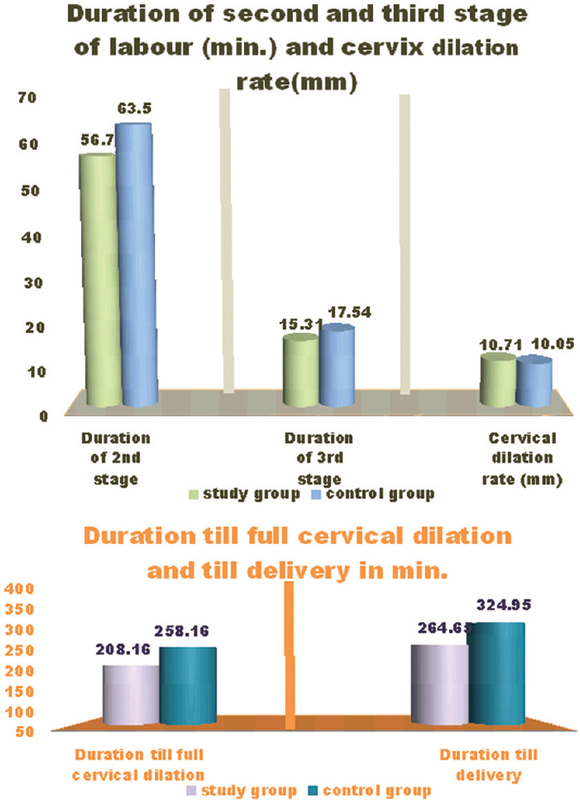 In the study by Al Qahtani and Al Hajeri , the mean duration from admission until full cervical dilatation was 165 ± 67.0 min in the study group and 214 ± 79.0 min in the control group, with a difference of 50 min in the study group. In the study by Al Khishali et al. , the mean duration from admission until full cervical dilatation was 167.7 ± 76.2 min in the study group and 193.8 ± 58.0 min in the control group; thus, the duration from admission until full cervical dilatation was shortened by 26.1 min. However, in the study by Aziz , the mean duration from admission until full cervical dilatation was 205.8 min in the study group and 270 min in the control group; thus, the duration from admission until full cervical dilatation was shortened by 64.2 min. In the present study, the rate of cervical dilatation was 1.71 ± 0.13 cm/h in the study group and 1.05 ± 0.06 cm/h in the control group. However, in the study by Shwetha et al. , the mean cervical dilatation rate was 2.78 ± 0.54 cm/h in the study group and 1.97 ± 0.28 cm/h in the control group. In the study by Edessy et al. , the mean cervical dilatation rate was 1.8 ± 0.59 cm/h in the study group and 0.98 ± 0.55 cm/h in the control group. In another study by Aziz , the mean cervical dilatation rate was 2.04 cm/h in the study group and 1.5 cm/h in the control group. In the present study, no significant difference was found as regards the duration of the second and third stages of labor, which was approved by Edessy et al. and Al Khishali et al. . In the present study, none of the patients reported postpartum complications. There was only one case in the study group in which delivery was through suction due to maternal distress. All other patients delivered vaginally. None of the studied patients delivered through cesarean section. In a study by Al Qahtani and Al Hajeri , instrumental vaginal delivery was performed in six women in the study group and in six women in the control group. However, delivery was performed through cesarean section in five women in the study group and in three women in the control group. Only two patients were complicated by vaginal tears reported in the study group. Thus, there was no significant statistical difference as regards mode of delivery and postpartum complications. In the study by Shedid , two patients delivered through forceps, 13 patients through suction, seven patients through cesarean section, and 53 patients delivered through normal vaginal delivery (NVD) in the study group; in the control group, three patients delivered through forceps, 22 patients through suction, 12 patients through cesarean section, and 38 patients through in the control group. Of the five patients who delivered through cesarean section in the control group, two patients were complicated by postpartum hemorrhage in the study group versus three cases in the control group. There was no significant statistical difference between the two groups as regards mode of delivery and postpartum complication. In this study, there was no significant statistical difference as regards CTG changes, Apgar score, neonatal weight, and NICU admission. These results were approved in the study by Aziz  and Edessy et al. .
On the basis of the results of the present study and noting the supportive data from similar clinical trials, HBB is effective in significantly reducing the duration of the first stage of labor and the need for further analgesia. Furthermore, it is not associated with any apparent short-term adverse outcomes in the mother or neonate. Bragg F, Cromwell DA, Edozien LC. Variation in rates of caesarean section among English NHS trusts after accounting for maternal and clinical risk: cross sectional study. BMJ 2010; 341:c5065. Brennan DJ, Robson MS, Murphy M, O'Herily C. Comparative analysis of international caesarean delivery rates using 10-group classification identifies significant variation in spontaneous labour. Am J Obstet Gynecol 2009; 201:308. e1–308. e8. Millen KR, KuaK, ZhaoL, GecsiK. Evidence-based guidelines in labor management. Obstet Gynecol Surv 2014; 69:209–217. Terkawi AS, Jackson WM, Thiet MP, Hansoti S, Tabassum R, Flood P. Oxytocin and catechol-O-methyltransferase receptor genotype predict the length of the first stage of labor. Am J Obstet Gynecol 2012; 207:184–188. Sadler LC, Davison T, Mccowan LME. A randomised controlled trial and meta-analysis of active management of labour. BJOG 2000; 107:909–915. Rohwer AC, Khondowe O, Young T. Antispasmodics for labour. Cochrane Database Syst Rev 2012; 15:CD009243. Shwetha BR, Subramanian S, Solanke PV. A study of the effects of drotaverine hydrochloride and hyoscine butylbromide in the acceleration of the first stage of labour in primigravidae at SMIMS. J Evid Based Med Healthc 2016; 3:1166–1169.DOI: 10.18410/jebmh/2016/267. Tabassum S, Afridi B, Aman Z. Phloroglucinol for acceleration of labor: double blind randomized controlled trial. J Pak Med Assoc 2005; 55:270–273. Vogel JP, Souza JP, Gülmezoglu AM. Patterns and outcomes of induction of labour in Africa and Asia: a secondary analysis of the WHO Global Survey on Maternal and Neonatal Health. PLoS One 2013; 8:65612. Goffient F, Breat G. Thefutureof labour management. In: Chamberline G, Steer P, editors. Turnbull's obstet. 3rd ed. San Diego, California, USA: Harcourt Publishers Limited; 2001. 487–491. Hodnett E. Caregiver support for women during childbirth. Cochrane Database Syst Rev 2000; 2:CD000199.quoted from . Fraser W Turcot L Krauss I Brisson-Carrol G. Amniotomv for shortening spontaneous labor, Cochrane review. Cochrane Database Syst Rev 2013; 18:CD006167.quoted from . Al Qahtani NH, Al Hajeri F. The effect of hyoscine butylbromide in shortening the first stage of labor: a double blind, randomized, controlled, clinical trial. Ther Clin Risk Manag 2011; 7:495–500. Al-Khishali WA, Rasheed F, Hussain S. The effect of 20 mg hyoscine butylbromide on Normal Labor in Iraqi Primi- and Multi-gravida Women. J Adv Sci Res 2012; 3:70–73. Aziz M. Effect of rectal hyoscine butyl bromide suppositories on first stage of labor. Int J Adv Res 2014; 2:128–135. Edessy M, EL-Darwish A, Nasr A, Ali A, Tammam M. Different modalities in first stage enhancement of labor. General Health Med Sci 2015; 2:1–4. Shedid AA. Rectal hyoscine-N-butylbromide safely accelerates progress of labor in primipara: a placebo-controlled study. J Am Sci 2012; 8:512–516.